The United Nations migration agency is hoping that the upcoming donor pledging conference for the humanitarian crisis in the Democratic Republic of the Congo (DRC) will generate more financial support to cope with a spike in the number of people displaced by violence. Since the last quarter of 2017, violence carried out by armed groups in the DRC has caused a spike in the number of the displaced, to more than 4.5 million. Due to lack of funding and access, a majority have yet to be reached with aid. In the Beni Territory of North-Kivu, attacks by armed groups displaced more than 2,200 people from their homes in the first week of February alone. This is in addition to the 1,500 people who were displaced at the end of January. As of mid-February, more than 12,000 displaced people were sheltering in that locality. Some funding has come in but not nearly enough to meet the critical needs of millions in the DRC. IOM says their most basic needs like food and shelter are not being met because no humanitarian actors have yet to reach the areas where displaced people are arriving. In the Djugu Territory, just south of North-Kivu, inter-ethnic violence between Hema and Lendu groups is flaring up, with 28,634 people fleeing burning villages and for fear of their lives to Bunia, Ituri’s provincial capital, in the last couple of weeks. In the greater Kasai region, previously considered calm, intercommunal and land-related conflicts have been escalating since 2016. During the worst days of 2017, the region had a population of about 1.3 million internally displaced people. Today, the region hosts 896,000 internally displaced people. The security situation has improved in some areas over the past months, prompting some internally displaced people to return to their places of origin. But those returning to burned down villages are in urgent need of humanitarian support. Since its release, only $4.7 million has been given towards IOM’s $75 million appeal for 2018, the agency said. The pledging conference will be held in Geneva, hosted by the UN, the European Commission and the Netherlands. Read IOM’s appeal here, which is part of the wider UN humanitarian response plan. 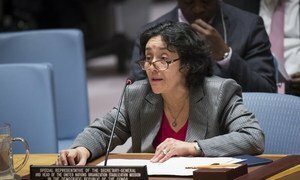 Highlighting political tensions and the disintegrating security situation in the Democratic Republic of the Congo (DRC), Leila Zerrougui, briefing the Security Council for the first time as head of the UN stabilization mission in the contry, said significant progress is being made on preparations for upcoming polls.